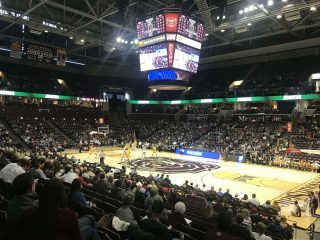 The Valparaiso Crusaders jumped out to a 22 point halftime lead and never looked back, beating the Missouri State Bears 82-66 Saturday afternoon at JQH Arena in Springfield. It’s the first setback for the Bears at JQH Arena after a 6-0 home start. Valpo took a 3-0 lead on a three pointer by Daniel Sackey under a minute into the game, and never trailed. The Bears got the contest tied twice midway through the first half, but after Jarred Dixon’s shot that knotted the contest 16-16 at the 10:09 mark of the first half, the Crusaders went on a 16-1 scoring run to open up a 32-17 advantage with 4:39 left in the half. When Bakari Evelyn drained a trey with 42 seconds left in the half, it put Valparaiso up 46-22. The Crusaders drained 12 three pointers on the afternoon, including six by Ryan Fazekas, while the Bears hit only six of 29 shots from long distance. Fazekas led four Valpo scorers in double figures with 18 points, while Dixon scored 23 points to lead Missouri State. MSU’s 6’8 junior Tulio Da Silva picked up his fourth foul just a minute and a half into the second half, and was held to eight points in just 19 minutes. The Crusaders improve to 9-6 overall, 2-0 in the Missouri Valley Conference, while the Bears drop to 6-9 overall, 0-2 in league play. The Bears drop to 25-4 in Missouri Valley Conference home openers, with a 9-2 mark at The Q.
Saturday’s game was Dana Ford’s 400th game as a coach, including 263 games as an assistant coach. Saturday’s announced attendance at JQH Arena was 4,179. The Bears will play at Indiana State Tuesday night at 6:00 p.m.